- Added live view auto restart on crash. Enable it via App Settings - Watchdog - Watchdog for live view. - Added Android Auto support. - Added 1-w audio for Android camera. - Added native Android Oreo support. 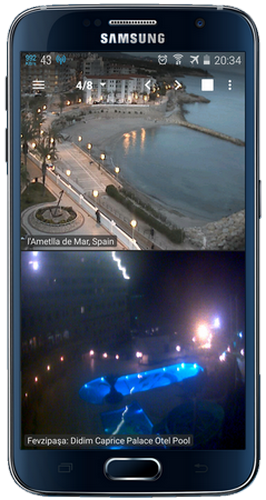 - Added preliminary support for Android P.
- Improved WyzeCam support, e.g. LED added. - Full Android 9.0 support. - Widget Settings for Android 8.0+. - Shows |R| if remote hostname is used in camera statistics. - Removed obsolete JPEG recording. Only H264/MP4 recording allowed. - Added Wyze Cam Pan and Xiaomi Dafang. - Added getting cameras settings via web server /get_cam_list.json and /get_cam_list_rtsp.json requests. - Fixed software decoder slow startup. - Added main/sub streams in app drawer. - Added auto stream profile. Sub streams - multiple layout, main stream for single layout. - Added audio playback via web server. - Added motion detection via web server. - Added 20fps for Wyze Cam via Admin commands. Default 10. - Added reporting Axis ACV-128401 vulnerability by scanner. - Added background mode for TVs. - Added audio for Xiaomi Dafang. - Improved Background Mode perf. if hw decoder. - Fixed Blue Iris 4 UI3. - Fixed audio recording in background mode. - Fixed crash while recording on Android 4.4. - Improved TV UI navigation. - Improved web server speed and responsiveness by allowing caching requests. - Added event log accessible via web server. - Allowed self-signed certificates for ownCloud/Nextcloud. - Added JCodec MP4 muxer. - Fixed FTP server unreliable uploading from multiple cameras. - Improved detection of Dahua cameras by scanner. - Added show advanced info in Camera Settings - Status for some cameras, e.g. Wyze Cam, ONVIF, etc. - Added support for more audio frequencies for AAC codec. - Added web server restart.